LEXINGTON, Ky. – Link-Belt introduces the newest member to its all-terrain crane lineup, the 175-ton (150-mt) 175|AT. Building on the success of its predecessors and designed with a philosophy of continuous improvement, this five axle 175|AT is Link-Belt’s most versatile and compact design yet. Loaded with features and a dramatic new look to match, the 175|AT is positioned to meet the demands and expectations of customers in all markets across the globe. Purpose-built and proprietary to Link-Belt, the 175|AT features a sleek two-person cab that has all the comforts a driver could want. Using new techniques, the 175|AT drivers cab is constructed of a lightweight powder coated aluminum extrusion frame and fiberglass external skin. As part of the design phase, extensive destructive testing took place to confirm the robustness of the lightweight construction. The cab successfully passed tests that included side impact, front impact, and roof crush. “Our development team placed an emphasis on improving efficiency behind the wheel and reducing driver fatigue – understanding that a driver can spend several hours a day driving to and from the jobsite,” said Curnutte. The interior features amenities such as automatic climate control, blue tooth radio, cell phone charging and LED lighting. An air ride seat with lumbar support, heating and ventilation will provide optimum comfort while driving. A multi-functioning steering wheel gives the operator fingertip controls for engine compression braking and cruise control. “A focus on driver’s efficiency is not a new concept for Link-Belt; we have raised the bar with this new cab,” says Curnutte. Link-Belt is introducing Pulse 2.0 to the driver’s cab with a 7-inch full color, touch screen display that doubles as the monitor for the Vision camera package. Pulse 2.0 continuously monitors carrier operations that include engine and transmission data, tire pressures and temperatures, suspension cylinder pressures, and even alerts the driver that the crane is ready for transport in dolly configuration. 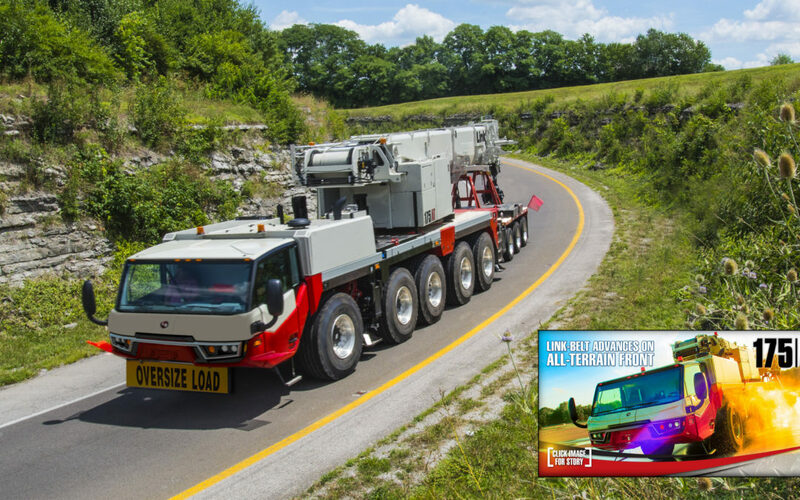 A 535 hp (398.9 kW) Cummins QSX15 will power the 175|AT, leveraging the long-term success of Link-Belt’s single engine hydraulic truck cranes. In a decisive effort to manage critical factors like weight and multi-functioning power, it was a clear choice to continue the single engine philosophy to this five-axle all-terrain with best-in-class power. A class leading 15-liter Cummins QSX15 tier 4 final off-highway engine provides an abundance of power to run carrier and craning functions. The 175|AT is standard full time 10X8X10 drive with on-highway speed-dependent steering and five jobsite travel steering modes. Through Pulse 2.0, V-CALC (Variable Confined Area Lifting Capacities) is the solution that allows the operator 81 different asymmetrical outrigger positions to best suit the needs of the jobsite. Confined space on jobsites will often prevent an operator from using fully extended outriggers. The operator can preview available capacities for all outrigger configurations on the Pulse display. Standard carrier features that operators are accustomed to include: four points of access to the flat carrier deck, a comprehensive camera “Vision” package, and the premiere lighting package on the market for nighttime operations. Expanding on these features, Link-Belt will introduce a new slip resistant paint coating on all designated walking surfaces to mitigate exposure to slips and trips. The operator’s cab is a success story in its own right, tailored for all terrain operations. Pulse 2.0 with its 10 in. (25.4 cm) touch display is at the heart of this crane with features and controls that are intuitive, adaptable, and in easy arm’s reach. The view from the seat is uninhibited in all kinds of weather with large sweeping wipers in the front and top, and strategically-placed vents for fast-acting defrost. The 175|AT is equipped with a six section 42.7 – 197 ft. (13 – 60.1 m) pin and latch greaseless formed boom and an optional three piece 10-32.5-55 ft. (3 – 9.9 – 16.8 m) on-board hydraulic or manual offset fly and three 18 ft. (5.4 m) lattice extensions. The maximum attachment will achieve a tip height of 315.1 ft. (96 m) making this crane desirable in many applications ranging from steel erection to cell tower service. The 10 ft. (3m) integrated heavy lift fly provides robust capacities and line separation for two load line operation in applications like precast wall panels. Time tested and proven features such as greaseless sheaves and Teflon wear pads cut maintenance and service costs. Additional standard boom features include wireless wind speed indicator, single-hand operation rope guard, and three work lights on the boom base section. The 175|AT will also feature the proven “Sure Lock” fly erection system. The “Sure Lock” helps ensure proper fly erection and stowage sequence while minimizing work at height. Link-Belt fly procedures have been embraced in the market on Link-Belt truck cranes and telescopic crawler cranes for their ease of assembly and one person operation. Getting to the job site efficiently is the name of the game. The 175|AT transports to the job with full 81,000 lbs. (36 700 kg) of counterweight in just two overflow loads, making it the most efficient to transport in its class. The 175AT has a more impressive chart, compared to the competition, with a similarly outfitted two load overflow. With standard boom dolly provisions, including dolly camera, this crane was designed for travel in all geographical markets. The 175|AT is capable of traveling under 26,500 lbs. (12 020 kg) per axle with 11,000 lbs. (4 989 kg) of counterweight on the crane and boom over the front. In dolly configuration, the counterweight can be stowed in several different configurations to meet different weight requirements. “We do our homework – things like no cheek counterweights, giving options on hydraulic versus manual fly – we set out to provide our customer’s a comprehensive list of options in this tonnage class,” says Curnutte.